A while back, I previewed a new commuter pack/pannier that I would be putting to the test – the Detours Ballard Market bag. Now that I’ve commuted (almost daily) with this bag for 2 months, I must say that I really like this bag/pannier! Though not as voluminous as my Market Pannier from Banjo Brothers, this bag proved large enough and has been wonderfully convenient for a daily go-to bag regardless of my bike choice/option for the day. On one day when I needed extra toting capacity, I used both the Detours and Banjo Brothers bags and they balanced me out well. On my debut ride with this pack a few months ago, I was impressed and this bag has continued to impress me in this summer of riding. 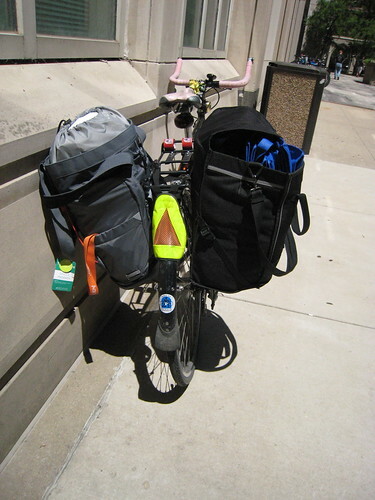 One of the greatest attributes of this bag is its versatility and ability to go with me for any commute – regardless of the rack set-up or lack thereof. As stated in the name of the bag, this bag pulls triple duty as a pannier, as an over-the-shoulder market bag and as a backpack! How convenient for someone who has found herself toting this bag nearly everywhere these past couple months and never feeling out of place with it…. as it does not “scream” bike commuter bag and can be a nice fashion accessory (girlie plus from someone who tends to value practicality over fashion). 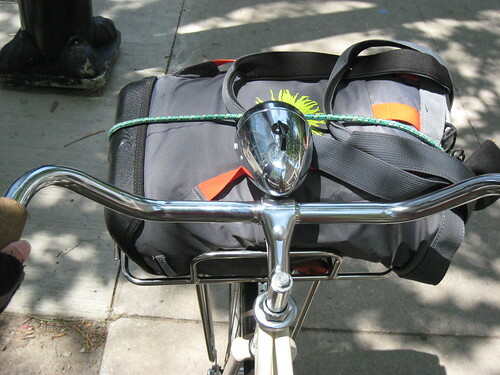 When I borrowed Dottie’s bike Coco (after Toro’s theft), the rack tubing was too thick for the clips on this bag – but I was still able to use the backpack feature! Another day (while test riding a bike from Heritage Bicycles) – I simply strapped the bag to the front rack and went – both with and without the rain cover. Finally a bag that can do all the heavy lifting of the bags designed to be for guys or gender neutral but with some flare. 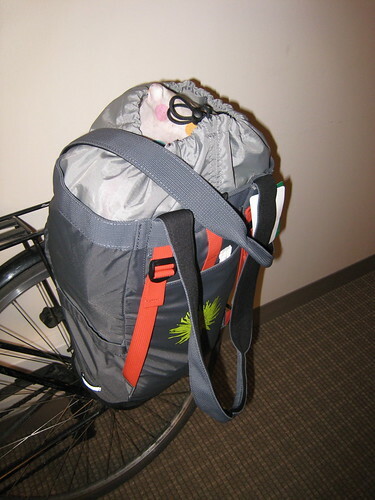 On more than one occasion I managed to STUFF this bag full of well…”stuff” – groceries or bike to work week goodie bags or just the build-up of daily commuting stuff. The Detours Ballard bag held it all. More importantly, it offered enough pockets – one internal zip pouch and multiple exterior pockets – to conveniently store small items that might otherwise get lost in a large open bag. 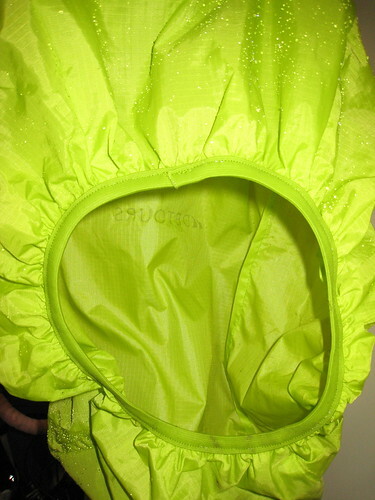 It also offered a hi-vis waterproof cover (that packs down and fits easily in a pocket and did keep the water out) for the few times I had to commute in the rain. One nice upgrade would be to have a built-in pouch to hold the cover with a tether to hold it in place and from getting lost/separated from the bag. When the waterproof cover is on the pack, it leaves the clips accessible for use as a pannier. When not full, this bag does flop over (but not in a bad way). I tend to not travel that lightly, so it was never an issue for me. The drawstring cord to cinch the top closed always was sufficient to keep things in the bag. The lack of a zipper or flap initially concerned me, but the drawstring was fine, with the waterproof cover doing its job when the rain fell. It’s just too bad there wasn’t an easier way to shield the bag contents from lighter rainfalls … without having to put the cover over the entire bag. 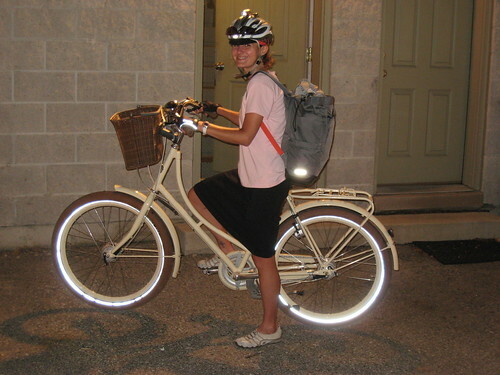 This clip system is similar to those I’ve seen on other panniers. 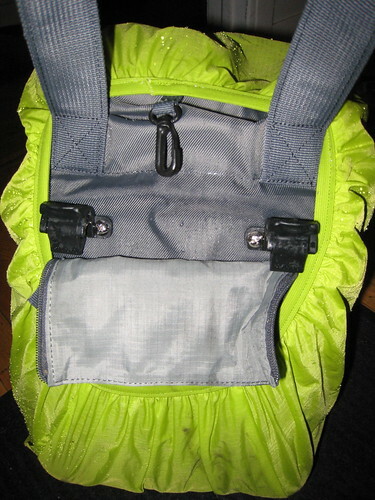 To detach the bag, it is a bit cumbersome at first – since you have to undo each clip separately. I learned to put the shoulder straps on my shoulder and that freed my hands to get the clips free. 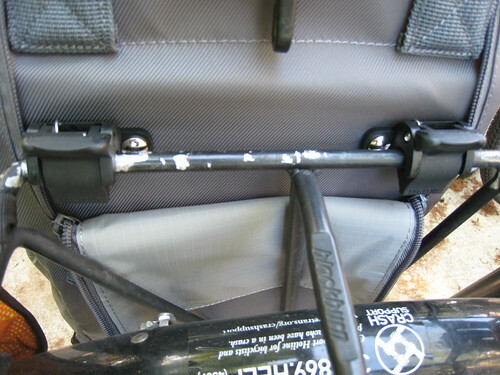 It would be much more convenient to have a strap attached to the clips that would release their grip when pulled up. 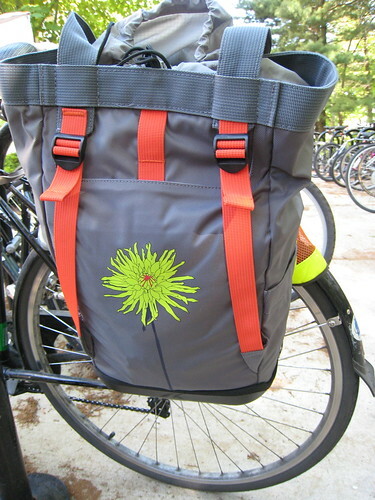 But – props to Detours for making a zippered flap that covers the clips when off the bike, so they don’t snag you or your clothes when just carrying the bag over the shoulder; very practical feature! I like the cover over the clips. 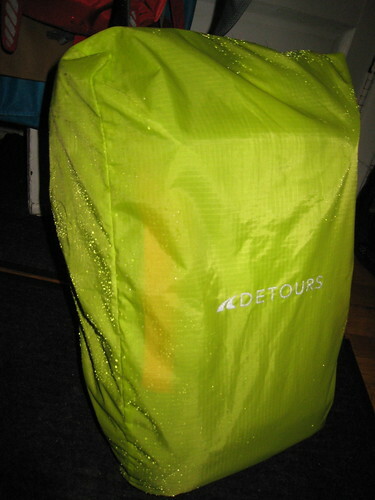 I’m not so big a fan of the rain cover – it looks a lot like the one for my Topeak trunk bag, and my experience with that one is that water can kick up from the ground and get in the bottom portions of the rain cover. It works OK for a short commute, but I wouldn’t want to use it for much more than half an hour. Run a short length of paracord between the clips and you will have your release strap. Nice review! Personally, I’d rock that flower…it looks good to me, not “girlie” but more whimsical. Thanks! And thank you for the detailed review…it is helping my purchasing decisions. Honestly, the clips aren’t much of a hassle for me at all. I just make sure I have the shoulder straps slung over my shoulder so I have both hands free… Unclip one, then the other…. just an extra few seconds of my time. I own a couple of Detours bags and have been very pleased with the mounting systems in terms of the secure hold and ease in mounting and removing from my rack. And they are just such good looking products. I got this bag a couple of months ago and it performed pretty well for a while. The capacity was plenty for commuting and a small amount of groceries, the clipping and unclipping was easy, and it was nice to have the backpack option. However, the clips came off after just two months of use– far from daily use. If you need a sturdy, reliable pannier, I think you’re going to have to look elsewhere. @Maggie – I just recently had the clip issue… literally 2 days ago happen to me. The company is aware. Please watch the video – it fully explains the issue and shows what they are talking about.